On 4 July 1972 Robin Jeanne Hoinville-Bartram left Melbourne in company with Anita Cunningham for a hitch-hiking holiday to visit her mother in Bowen, QLD. On 15 November 1972, Hoinville-Bartram's remains were located in Sensible Creek under a bridge on the Flinders Highway, approximately 80 kilometres west of Charters Towers. She had been sexually assaulted and shot in the head with a .22 calibre rifle. No trace of Anita Cunningham has been found. Hoinville-Bartram and Cunningham were two of seven female hitch-hikers who were killed in Queensland between 1972 and 1976. Police have not ruled out that the women may have been the victims of a serial killer. Information indicated the pair, who began their journey from NSW's Hume Highway, had gone to Darwin before travelling to Mount Isa. Police have been examining the movements of backpacker killer Ivan Milat when the pair disappeared, but also are interested in Arthur Stanley Brown, who was charged in 1998 with the murder of two Townsville schoolgirls in 1970. The Minister for Police and Corrective Services has approved a reward of $250,000 be offered for information which leads to the apprehension and conviction of the person or persons responsible for the murder of Robin Jeanne Hoinville-Bartram and Anita Cunningham in September 1972. Mount Isa detectives have joined police in Townsville to investigate a 30-year-old murder mystery. Police found bones during a search at Sensible Creek, near Pentland, south-west of Charters Towers in north Queensland, earlier in the week, and hoped they may have been linked to the disappearances of Robin Hoinville-Bartram and Anita Cunningham. The two student nurses disappeared in 1972. Tests have confirmed the bones are not human, and regional crime coordinator Detective Inspector Richard Nikola says police are seeking more information. "We're not going to reveal any more at this stage in relation to witnesses who have come forward, but there are ongoing investigations," he said. "But the CIB from Mount Isa are here working with us on different aspects and the investigation, as I said, is proceeding according to the strategy we put in place." QUEENSLAND police have reopened a 30-year-old murder inquiry after new information about the disappearance of two young women hitchhikers. High-tech equipment, excavators, engineers and SES volunteers will join police next week in searching for the body of 18-year-old Anita Cunningham who has been missing since 1972. The body of her 18-year-old friend and travelling companion, Robyn Hoinville-Bartram, was discovered in a shallow grave in a creek bed near the north Queensland town of Charters Towers on November 15, 1972 but Ms Cunningham's body has never been found. Queensland Police Service northern region Crime Coordinator Richard Nikola said the case had been reopened after information was received a week ago from a Melbourne man about the route the two young hitchhikers had been taking to visit Robyn's mother who lived in Bowen. "We are going to have another look at the area where Robyn Hoinville-Bartram's body was found with more modern equipment than they had 30 years ago," Det Inspector Nikola said today. "We've now got a witness who was close to them in Melbourne. "It proves they intended to go via Darwin and come back through the Isa (Mt Isa) to Bowen." Police and SES volunteers will be looking for clothing, jewellery and skeletal remains in the search at Sensible Creek, about 80km west of Bowen, Det Insp Nikola said. WHISKEY Au Go Go killer John Andrew Stuart has been linked to another murder mystery. 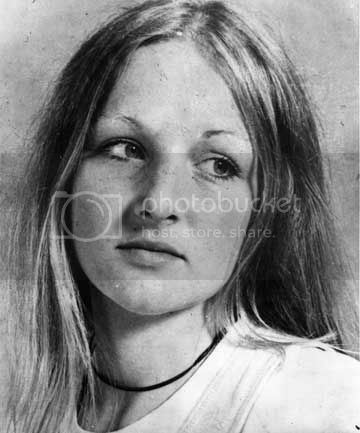 Police have received information linking Stuart to the scene of the unsolved murder of hitchhiker Robin Jeanne Hoinville-Bartram, 19, who died a few months before Stuart and James Richard Finch were involved in the fire-bombing of the Whiskey Au Go Go nightclub in Brisbane's Fortitude Valley on March 8, 1973 – 35 years ago this weekend. Fifteen people died in the nightclub in Queensland's worst mass killing. Stuart and Finch were convicted of the attack, with Stuart dying in jail in 1979. The girl's remains were found in a shallow grave under a bridge at Sensible Creek, near Pentland, west of Charters Towers, on November 15, 1972. She had been shot twice with a .22 weapon through the top of the head, possibly while kneeling. Forensic scientists estimated the murder took place about three months before discovery, but the timing was indecisive because of factors such as extreme heat and water and interference of native animals. New information given to detectives points to Stuart being at Sensible Creek in early October 1972. A Charters Towers detective last week interviewed Bowen man Randall Wilson, who claimed he met Stuart at Pentland that year. He was able to fix the time because he had just celebrated his 21st birthday on September 30, 1972. "I was working for the railways," Mr Wilson told The Sunday Mail this week. "I was acting stationmaster at Pentland, staying in a room at the back of the Pentland pub. I met Stuart and we drank together at the pub. "He was a bit sharp, a bit of a smart-arse. He found out what I did and where I was staying. "I left him to go 'roo shooting about dusk and when I got back, I found just about all my gear, including money and 21st birthday presents, was gone. "He left something a bit chilling. On the bed he had neatly laid out a single set of my clothes. Laid out like a body. There was a shirt, neatly in place, under that an arranged belt, then a pair of my jeans and at the bottom of the jeans was footwear arranged to look like there were feet in them. "I took off after him, heading west, but he must have gone the other way. "A railway gang working near Sensible Creek later found some of my discarded clothing. He must have stopped at the bridge and sorted out what he didn't want and threw it away." Detectives from Brisbane's Homicide Squad and Charters Towers are trying to determine if Stuart's presence at Sensible Creek, close to the time of the girl's murder, was just weird coincidence or something more sinister. Detectives know Stuart travelled to Darwin by car with a young woman, whose identity is also known, before the nightclub fire and Pentland was on the most logical route. They are now trying to match Stuart's movements with the last-known movements of the murdered girl. Robin Hoinville-Bartram left Melbourne in July 1972 on a hitchhiking holiday to see her parents in Bowen. She was last seen alive on the Gold Coast and was reported missing on September 15 that year. She was travelling with Anita Cunningham, 17, who has not been found. THE best friend of a woman murdered almost 40 years ago is appealing for a woman who disappeared without a trace at the same time to come forward to help solve the crime. In one of Queensland's most baffling unsolved crimes, Robin Jeanne Hoinville-Bartram was murdered at Sensible Creek west of Charters Towers in 1972. The girl's remains were found in a shallow grave under a bridge at the creek, near Pentland, west of Charters Towers, on November 15 that year. The woman she was hitchhiking from Melbourne with, Anita Cunningham, was never heard from again and no traces of her were ever found. But Ms Hoinville-Bartram's Bowen high school best friend, Kathleen Bertram, said she believed Ms Cunningham was still alive. Brisbane-based Ms Bertram last week travelled to the spot where her best friend was buried in a bid to highlight the unsolved crime and plea for Ms Cunningham to come forward. "The reason why I think she's alive because she was seen by ... a personal family friend in December 1972 working in the Annabella Bar in Melbourne," she said. "People say Anita is dead with Robin, but there has been no trace of Anita Cunningham or her property since that day, since Robin was murdered. People just presumed she was dead." Ms Bertram said she had also heard Ms Cunningham had been writing to school friends. She suspected Ms Cunningham, who was 17 at the time, vanished without a trace because she was protecting her friends and family from a notorious criminal she believed was responsible for Ms Hoinville-Bartram's death. John Andrew Stuart, 33, was arrested for the infamous Whiskey Au Go Go fire in Brisbane Fortitude Valley where 15 people died after the nightclub was fire-bombed in the early hours of March 8, 1973. Ms Bertram said Stuart was in Pentland in October 1972. Bowen man Randall Wilson told media in 2008 he saw Stuart had stolen his property after he had befriended him at Pentland at the time. Ms Bertram said she met Mr Wilson when she made her journey north to pay tribute to her best friend. She said she believed Stuart was travelling with the girls, who were last seen on the Gold Coast and were reported missing on September 15. They were travelling to Bowen to see Ms Hoinville-Bartram's parents. Charters Towers detectives and the Brisbane Homicide Squad were examining Stuart's links to the crime but are yet to publicly reveal whether his presence in North Queensland was coincidence or something more sinister. Ms Bertram said she wanted Ms Cunningham to come forward to put an end to almost 40 years of wondering exactly what happened to her best friend. IT is my enduring hope that you are still alive and able to read my plea. I have always believed that you were spared the fate of Robin and have been forced to hide for all these years for your own and your family's safety. Dear Anita I fully understand the impact that Robin's murder must have had on you, especially if the connection with John Andrew Stuart is proven. I would imagine that your life and your health have suffered greatly and I fully sympathise. I am pleading for you to come forward, so that Robbie's family and I can at last obtain closure. My reasons for this is the search for justice, and an opportunity to place a proper plaque on Robbie's grave to include her date of birth and date of her death, with the words ''Morning has Broken''. There has been too much suffering and it is my fervent wish that this might give hope to those others who also have lost loved ones.